One of the points commonly thrown about in discussions on the significance of Hasankeyf is that of its continuous habitation, thought to date back many thousands of years. But aside from an impressive role call of past inhabitants and their stone-and-mortar vestiges, why does it matter that these ghostly antecedents were there, in Hasankeyf, and that people are still there now, today? Hasankeyf's name may be related to "Kipani," mentioned in texts dating back to the rule of Assyrian king Assurnasipal II in the 9th century BCE. In the first century CE the East Roman historian Procopius refers to it as Ciphas (look here for a general history of Hasankeyf). Evidence of human settlement at Hasankeyf is most easily found in the monuments and artefacts that dot the town, marking the traces left there by Byzantines, Artukids, Ayyubids and so on. Indeed, the diversity of Hasankeyf's archaeological heritage is frequently cited as the chief reason it should be given UNESCO recognition. ...But, walking in the hills and canyons surrounding the city last month, another way in which use, habitation, human presence really matters was brought home to me. As literal as it is simple: the trails we leave. 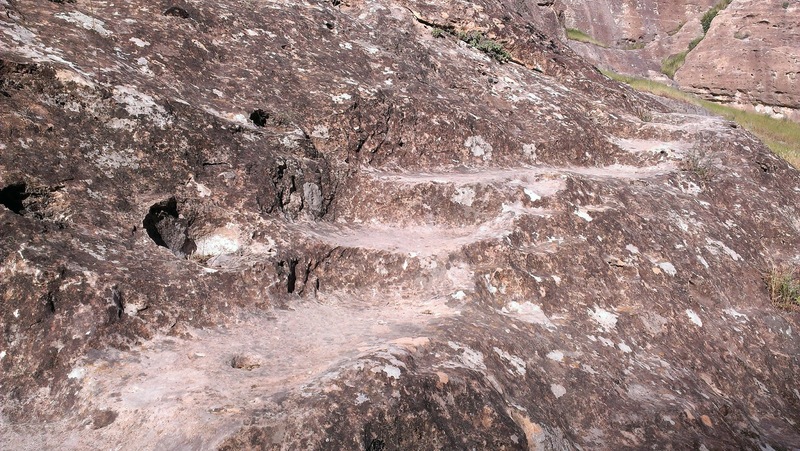 The sides of the canyons are stippled with rock-cut steps, even handholds. As you negotiate them, mapless, the way reveals itself in stone rubbed clear of moss and lichen by the passage of predecessors. Yesterday, last week, last year, last century. The existence of this anonymous inheritance is entirely dependent on uninterrupted habitation. Take away man and in five years the trails will be blurred by vegetation; in less than 20, almost invisible. Of course, some of these paths may in any case be erased by a lake and obscured by silt and mud before they have a chance to grow bosky with disuse. But even those remaining high and dry will be left literally so; orphaned, cut off from the flow of people that created and perpetuated them. In the grand scheme of things, alongside all that stands to be lost if the Ilısu Dam is impounded, this may seem a minor figure in a greater tragedy, but it is one the visitor feels keenly, as she explores Hasankeyf in the footsteps of the millennia. Helen, Great post. As someone who loves to walk in the countryside, I've often thought about the paths that I find - how long has it been here? who has used it? where were they going? In Hasankeyf, those questions are all the more intriguing because of its incredible rich history. So glad you liked it. We missed you both at the Ingathering!